Title Card: The love affair between the artistically-inclined English community and Florence was soon to be overshadowed by the clouds of war. Title Card: But at the moment the sun is still shining on the squares and statues, and the dictator Mussolini is the gentleman who makes the trains run on time. Connie Raynor: Excuse me, are you the Consul? Connie Raynor: Connie Raynor of the Morning Post. I'm fascinated to know what His Majesty's Consul in Florence makes of it all? 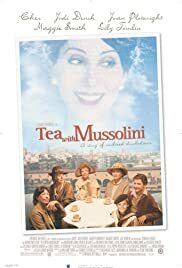 It's certainly not clear how fictionalized a version of Zeffirelli's autobiography "Tea With Mussolini" is, what with the usual disclaimers at the end. Even presuming this is just a riff off an incident in his life, that he had some contact with memorable English ladies, it's clearly his tribute to where his love of English literature comes from, particularly Shakespeare. He's done several Shakespeare interpretations-- movies, opera and play directing. The film has a lovely scene of him being first introduced to acting out "Romeo & Juliet" with puppets, as well as constant quotes from Shakespeare throughout about war and his situation. I was surprised how good the movie was - I was in tears several times, especially with visuals that bring up the same comparisons as "The Train" did, with art vs. war, humanity's heights of creativity vs. its lows of prejudice and violence. These Oscar-winning ladies are absolutely terrific, yes including Cher. One elderly gentleman behind me complained that Maggie Smith basically always plays the same character but I thought her character does change towards the end. The others were certainly not their usual on-screen personas, Judi Dench as a free-spirited artist, Joan Plowright as a quite warm-hearted grandmotherly type, and Lily Tomlin a hoot as a butch archaeologist. But why choose bland Italian actors for them to play off of? To make the Scorpioni, as they are called, stand out more? The Italians seemed stereotyped to me, Latin lover, ignorant peasants not appreciating their ancient artistic heritage.